Addie Moore and Louis Waters, a widow and widower, have lived next door to each other for years. When Addie tries to make a connection with her neighbor Louis, the two people begin sleeping in bed together platonically, with the innocent goal of alleviating their shared loneliness. 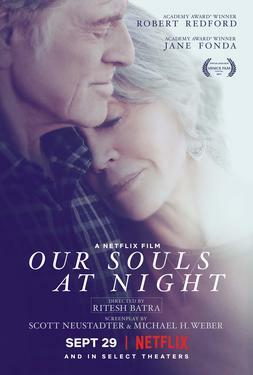 As their relationship deepens, however, they confront their feelings of grief and loss, explore what comes next, and a real romance begins to blossom..